I taught a class in our park using a Creative Thimbles pattern called Ursella or Emily. 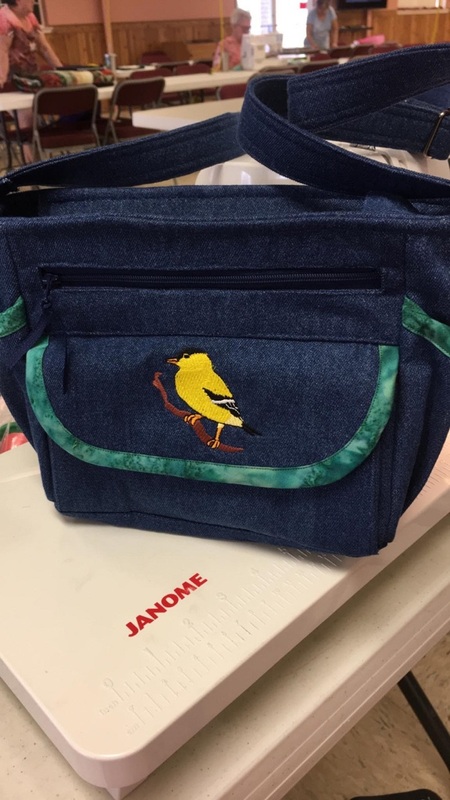 My sister-in-law had been wanting a bag with a bird embroidered on it so I hunted in my designs and found this one...sorry but I do not know where it came from...her bag is ready for delivery! I really like the bag you made for your sister-in-law. The bird is so happy looking. I also think using denim is very practical. I am sure it will be well received. I really like this bag!!! Great job! Very pretty bag and cute bird. Beautiful bag! The bird is a very nice touch. I keep coming here and seeing things and thinking … Oh, I've been wanting to do on of those … This is another! Looks like you're having fun. I miss being a "snowbird" this year and sewing with the club in AZ this year. That is what your picture reminds me of. Great bag too. Little songbird is so cheery. I've had that pattern for about 5 years and can't decide what fabrics to use... Also, I'm a little intimidated by all the pattern pieces... I've made more than 150 quilts, and numerous totes and duffel bags, but purses still make me crazy. Thanks for the inspiration! Love this bag! The bird is such a nice addition to it. Super bag. Is that a goldfinch that you embroidered? I love the color. Very nice bag and your SIL will appreciate the work that you put into her new gift. Wow! That is lovely. You did a great job. I have to look up that pattern. My ladies would love to make it. Thanks for sharing. You did a great job on that bag. It's adorable. Love it and know your sister-in-law will too. Thanks for sharing. Very attractive bag. Love the birdie! Very nicely done! It looks like a designer bag. Awesome bag, and I totally understand about the denim. I made a computer tote a few years back that I swore would be my last for the same reasons. Then my mother appropriated my bag. I did make another, only instead of stitching and turning inside out, I stitched it so the seams faced outward, and shredded them like a rag quilt. I liked it even more than the first one!